New developed MIS-diodes covered with AIXaTECH’s low temperature epitaxy AlN as a dielectric exhibited three orders of magnitude lower gate leakage current compared to conventional Schottky diodes. In cooperation with the Nanyang Technological University of Singapore the behavior of HEMT structures covered with AlN have been investigated. 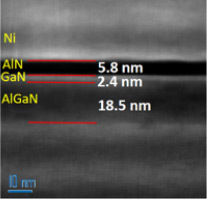 Matthew Whiteside in the team of Professor Arulkumaran have used AlGaN/GaN metal-insulator-semiconductor (MIS) diodes with AIXaTECH’s low temperature epitaxy (LTE) AlN grown at 200°C as a dielectric. The new developed MIS-diodes exhibited 3 orders of magnitude lower gate leakage current compared to conventional Schottky diodes. The interface state density (Dit) was estimated at a minimum value of 2.6×1012cm-2eV-1at 0.24 eV below the conduction band. This work was presented at the 3rdElectron Devices Technology and Manufacturing (EDTM) Conference 2019 in Singapore and was published in the IEEE EDTM conference proceedings. AIXaTECH’s novel low temperature epitaxial process now also demonstrates its capability in a further application field. With its high throughput and in-line architecture GaN-based electronics can be price competitive with silicon based electronics.